Pero and Mira Jovic are refugees from Croatia who have integrated in the local community of Trebinje, BiH. After coming to Trebinje they had a daughter and a son. Throughout their years as refugees they looked for adequate accommodation and, according to Pero, “The worst was the feeling of uncertainty and when you don’t know where to go and which path to take“. Early in the 2000s, Pero and Mira started building their own house on a plot they were given by the local community; however, they had insufficient funds to build an adequate house and built adequate home for family’s need, but then the Regional Housing Programme stepped in. The Jovic family learned about the RHP from an association of refugees in the town of Trebinje, but they didn’t expect to become RHP beneficiaries. However, when they were visited by engineers tasked to make a bill of quantities, they became certain that they will get a new house. Pero underpins the role of the local community which provided the land plot that is now owned by the Jovicic family, and he is deeply grateful to the contractors who constructed a housing unit of good quality for his family. “We are completely happy with this housing solution”, says Pero. The Jovic family moved into their new house in 2017 and they say they are happy with the way in which the new community has accepted them. “We are entirely satisfied with the support from the local community and, if integration was like this everywhere, we wouldn’t need any additional assistance”, emphasizes Pero. Mira’s primary job includes production of vegetables in their greenhouse which they received, together with a digger, from the CRS (Catholic Relief Services), as part of the social and financial support provided by CRS to RHP beneficiaries. Mira has been growing vegetables and flower seedlings in the greenhouse for three years now and she has even customized her car so as to be able to distribute her produce to the local farmers’ market. Mira highlights: “Our customers are people living in the area of Trebinje. This type of production generates a solid income, so in addition to the salary my husband earns in the local electric power company, it is sufficient for us to lead a normal life“. 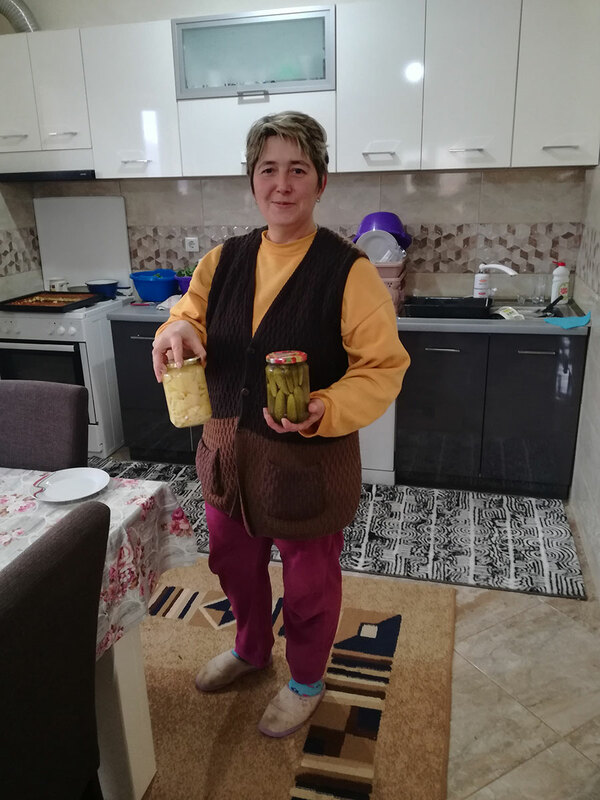 She produces and packs pickled vegetables such as cornichons, peppers, hot peppers etc. for their personal use, while they share the rest with their family and friends. Mira also makes a variety of cheeses. She stresses that the advantage of having a greenhouse is the ability to produce crop plants such as peppers, tomatoes and the like, throughout the entire year. The Jovic family has received social and financial assistance from the and the US Department of State’s Bureau for population, refugees and migration. Additional funds for social and financial support to the most vulnerable RHP beneficiaries in BiH have been provided by the Government of Switzerland, USAID, CEB, as well as national institutions such as the Ministry of Human Rights and Refugees of BiH, Federal Ministry of Displaced Persons and Refugees and the Ministry of Refugees and Displaced Persons of RS. At the end Mira shares her life motive: “All is well as long as there is no war and we are healthy”.